1Click File and click Add Account. The Add Account dialog box opens. 2Fill in the information requested (name, email address, and password) and click Next. 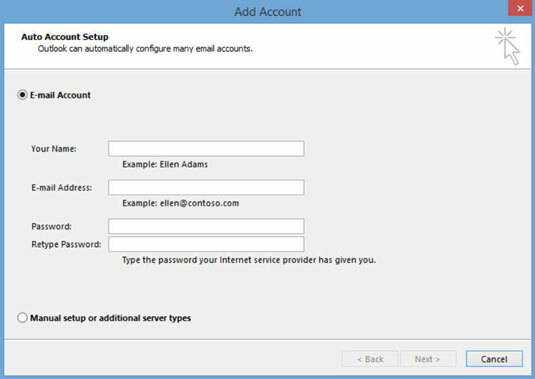 Outlook tries to detect the server settings and log into it with an encrypted connection. 3If Outlook is successful, a message appears to that effect; click Finish and you’re done. If it is not successful, a message appears that reads Click Next to attempt using an unencrypted connection. Click Next to do that. 4If Outlook is successful, click Finish and you’re done. If it is not successful, click to mark the Change account settings check box and then click Next. 5Click the button for the type of account you have (for example, POP or IMAP) and click Next. Then fill in the information requested and follow the prompts to complete the setup. For example, for a POP account, you will see the screen shown. Check with your provider if you are asked for any information you don’t have, such as incoming or outgoing mail server. 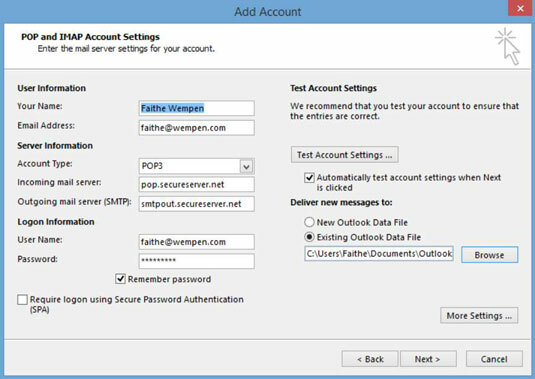 For a POP3 account, if the test message doesn’t send correctly, you might need to click More Settings and enter some special settings for the server. Your provider will tell you what those are if needed.